The history of British pubs began with inns for travellers (then called tabernae) on Roman roads in the 1st century. Pubs and bars have been around for a long time, a mainstay of our high streets and a primary social gathering space. But how are they dealing with the modern world? Are they adapting to the changing society around them? And are they making the best use of new technology? CAMRA says that 21 pubs close down every week in the UK. There are many pressures, not least financial ones, on the entire hospitality industry. Increased drinking at home is reducing the numbers of customers going out to pubs and bars. Perhaps an even bigger threat is that young people are drinking less alcohol than their parents: more than one in four 16 to 24-year-olds do not drink at all, and fewer are binge drinking. This is good news for public health, but what will it do to the future of pubs and bars? There are also more positive trends. The quality and variety of non-alcoholic beers is rapidly growing. New brands of soft drinks, often with much less sugar than the traditional ones, are appearing all the time. And the demand for these new drinks is growing fast; in fact they are among the few areas of growth in pub and bar sales. Yet they are all but non-existent in most venues – even though when surveyed, the majority of venue managers agree on their importance to increasing sales. Club Soda has been working with pubs and bars in Hackney, east London for over a year, with the aim of making them more welcoming to people who want to drink less alcohol or none at all. From this work, we’ve learned a lot about how these licensed venues operate, and the challenges they face (you can read our first report here). From our research, we have concluded that many venues operate in rather old-fashioned ways. Even when their owners and managers acknowledge that they should change something (e.g. stock a non-alcoholic beer), they are unlikely to take action by themselves. For positive change to take place, a bit of gentle nudging is needed. This may be as simple as giving pubs and bars the contact details of a local soft drinks producer. We have successfully worked with venues to change their behaviour, but for this action to be easily scalable, it can’t be based on physically going in and talking to the venue managers in person. This year, in partnership with drug and alcohol charity Blenheim, we are therefore developing a tech solution to nudge large numbers of venues at once. Underpinning our project is behaviour change science – often applied to individuals, but rarely to businesses and their owners and managers. We have mapped the behaviour change techniques most likely to influence the behaviour of pubs and bars, from peer pressure (seeing how well other local venues do), feedback and information (from the self-assessment tool and their customers). Our aim is not to set up new rules, regulations, or formal licensing conditions. Instead, we are looking for voluntary action by the venues, guided by customer demand and feedback. 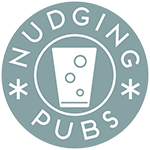 The next stage of our Nudging Pubs project was therefore to build a listings and customer review and rating website, based on the needs and wants of customers. 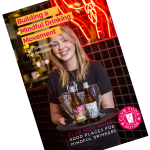 It does this by letting the venues complete a short self-assessment of their non-alcoholic and lower alcohol drinks, and then giving them feedback and simple ideas for improving their offer. The customer-facing part of the website is about reviews and ratings – people will be able to rate pubs and bars on how visible their non-alcoholic drinks are, and how helpful the staff are in suggesting and selling them. This will be supported by a social media and publicity campaign to get customers visiting local venues in January – traditionally their most quiet month. Our project is still in progress, so its effectiveness has not yet been evaluated. One indicator of the willingness of licensed venues to get on board with something like this is their existing online presence. To get a measure of this, we took the list of all licensed venues in Hackney, identified pubs and bars (ignoring restaurants, shops, etc), and searched for any online presence they have. Of the 209 venues on our list, we found that 72% were on Twitter, 60% on Instagram, and 85% had a website or a Facebook page (or both). Keeping in mind that Hackney includes the trendy areas of Shoreditch and Dalston, we would expect that these figures for all of UK would probably be lower. A listing guide is a familiar format for pub and bars. There are a large number of listings apps and websites out there already, which most venues are quite happy to be on. The novelty in our site is the set of behaviour change tools built into it. 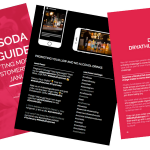 We believe that our Club Soda Guide has the potential to shift the venues’ behaviour, towards a healthier future both for their business and for their customers.